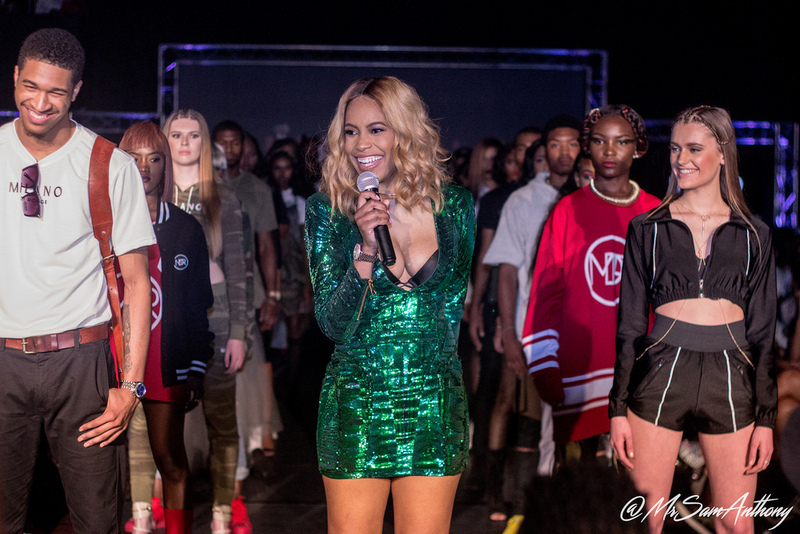 Philadelphia, PA. 24 May 2016 – This past Sunday, luxury street wear brand Milano Di Rouge took a fashion voyage at their Next Stop fashion show at 2300 Arena in Philly. ‘Taking off’ in Philadelphia, over 300 guests gathered to be taken on a visual 5-city tour through the top fashion hotspots in the world – NYC, Tokyo, London, Milan and Paris. This travel themed runway show featured over 20 looks from Milano Di Rouge’s new 2016 AW (all wear) line set to be available this coming summer. Alongside of the show, guests enjoyed two amazing dance performances by a burlesque and ballet dance group, music performances by Kayla, Jay Marie, Sierra & Brandi, complimentary cocktails and hors d’oeuvres and networking with the who’s who in Philly. Brooklyn Nets player, Rondae Hollis-Jefferson made a guest stroll down the runway in the Milano Di Rouge 5-cities T-shirt, as well as an appearance by cancer survivor and advocate Leah Still. Notables in Attendance: Brooklyn Nets player Rondae Jefferson, Rapper Young Chris, Gospel Artist Jermaine Dolly, Motivational Speakers Dana Chanel & Prince Donnell, Cancer Survivor and Advocate Leah Still and her mother Channing Smythe, Rapper & Comedian Boone, Rapper/Actress Summer Valentine, Fashion Designer Iris Bonner, Good Girls Group, Nia Andrews – Miss Bucks County, Allison Gress- Miss Montgomery County, Philly Fashion Week Coordinators – Kerry & Kevin . Overall the Next Stop fashion show was one for the books! Each guest left feeling ‘jet-lagged’ from the non-stop fashion fun they experienced at this unique runway presentation. “What is a dream? A dream is a goal, an inspiration, a dream is where hope lives. Find what your dream is and never let it go until it becomes a reality; and once you make that dream a reality, you dream some more, you dream bigger, you dream better…. but you never stop dreaming,” Milano Di Rouge Owner Milan Rouge States. Thank you to our event sponsors: Steve Madden, Kesha’s Kitchen, Cakeadelphia, Stress Free Travel, My New Philly and Ta’Shae Momentum Dance Co.